Having a good credit report is essential in moving ahead in your life. Having a good credit report is essential in moving ahead in your life. If you have a good credit report, you will be able to qualify for home and car loans, apartment leases and can even increase your chances of getting a your dream job. Unfortunately, credit report errors are pretty common and if not corrected, they can seriously damage your credit. The Fair Credit Reporting Act (FCA) regulates how the three credit bureaus (Equifax, Experian and TransUnion) treat your credit information and necessitates they keep precise and up to date credit records. Each consumer is entitled to a complimentary copy of their credit reports every year, from each of the three major credit bureaus. You can request your free credit reports at the same time each year or stagger your request so that you are checking throughout the year.—. If you are planning on taking out a loan or applying for new credit, it is important that you perform a credit report check before you apply. By doing so, you will have time to correct any errors that may be on your credit report before a creditor checks your report. 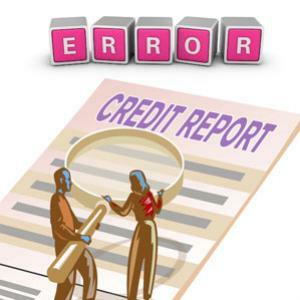 To help you understand more, listed below are some of the more common causes of credit report errors. • Identity Theft- Identity theft is one of the most common causes of errors on credit reports. If you get your credit reports checked regularly you will be able to determine if accounts have been opened in your name. Identity theft will also create new hard inquiries that you did not initiate and could also uncover debts that you did not create. To correct these types of credit report errors you will need to fill out an identity theft affidavit which can be accessed through the website of the Federal Trade Commission (FTC). • Human Error at the Credit Bureau- Due to the large number of credit reports that the credit bureaus handle, there are instances when human error contributes to an error on a consumer’s file. This occurs when a consumer’s account is being updated and the information is erroneously entered into the incorrect consumer’s account. There are many people who have encountered these errors and while some of these errors are minimal, some can be damaging. To correct this problem, you should write a letter detailing these errors to the credit bureaus to have them corrected and mail it along with documents that can support your claim. • Restricted Access- Before someone gets to see your credit reports, they need to get your permission. Your current banks, your creditors and other lenders to whom you applied for credit should only be the entities who have access to your credit files. If you preview your credit report and see that there are inquiries made by creditors, banks or lenders that you didn’t apply to, you can file a claim against them for a violation. • Errors in Billing Statements- Errors in billing statements, especially in credit card bills are fairly common. If there are fees and unnecessary charges that show up on your billing statement, you have the right to challenge the mistakes and have them corrected. Most billing statements provide an address, different from the billing address, where you can send your billing disputes. It is very important that you check your billing statements as soon as they arrive, as most banks and other financial establishments only handle issues regarding billing errors within a certain period of time. • Human Error on Billing Statements- Usually, these errors are simply honest mistakes. The person encoding your information might have typed in the wrong name, address information, the charges or payments and possibly even the date of your financial transactions. The incorrect date entry is fairly common. When it happens, the creditor thinks your payment is late, you are charged a late fee, and the credit bureau is informed of your tardiness in making your payment. You really can’t avoid these errors, but by keeping a close watch on your accounts and credit report, you can have corrections made quickly. Regardless of the cause of the errors, erroneous information should always be disputed with the credit bureaus as well as the creditors who reported the information. While it is now possible to raise your concerns online, it would still be a good practice to write a dispute letter and send it via mail with a requested return receipt. Do not forget to include a photocopy of your valid ID, along with your letter, so they can verify your identity. Keep in mind that, the more documents you have that support your claim, the greater your chances of having those errors removed from your accounts and credit reports. Once the credit bureaus and the creditors receive your letter, they are required to conduct an investigation and report the results to you. If they cannot prove the reported information, then they must either correct the error or delete it you’re your record completely.